Prominent & Leading Exporter from Delhi, we offer curtain tieback, curtain tiebacks, curtain tie back and wooden tieback. Size 13"-3" Cords & Tassels 6". 1)Size 13"-3" Cords & Tassels 6". 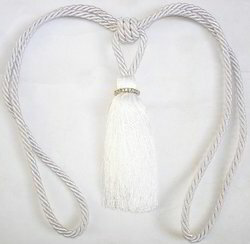 Size Tassel 11" & Cord 16"
* Size: Tassel 11" & Cord 16"
* Used In Curtains And Any Where You Like To Use. * We Can Make In Any Size, Colour, design As Per Customer's Requirements. Size 12" & Cord 16"+3"
Size: Tassel 12" & Cord 16"+3"
Used In Curtain Tieback , craft Projects, And Any Wheres You Like To Use. We Can Make Any Size, colour, design As Per Your Requirement. Packaging Details: STANDARD SIZE ACCORDING TO CUSTOMER'S REQUEST. Size 11" & Cord 16"
* Used In Curtain And Any Where U Like To Use. * Beautiful Colour And Design. * We Can Make In Any Colour,size Design You Required. Used In Curtain & Any Where You Like To Use. Available In Varies Colour And Size. 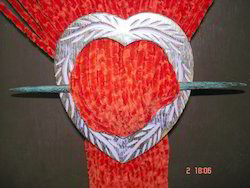 Size 16"-4" Cords With Metal Bead Head 3.5" Tassels skrt 8"
Size Tassel 8.75" & Hanger 12". 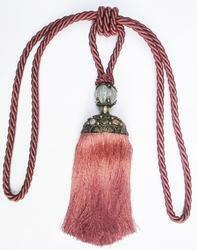 Size : Tassel 8.75" & Hanger 12". Used In Curtain & Any Where You Like To Use, Available In Varies Colours & Size. 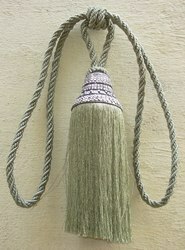 Size: Tassel 6" Cord 14"
Used In Curtain Tiebacks And Any Where You Like To Use. We Can Make In Any Size And Colour You Desire. 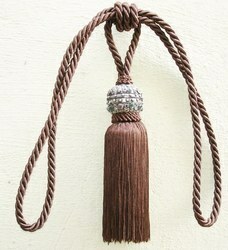 Size: Tassel 11" & Cord 16"
Used in curtain & any where u want to use. Available in varies colours & design. 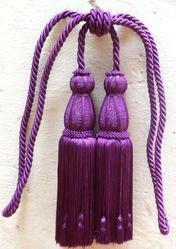 Size: Tassel 9" Cord 14"
We Can Make In Any Size, colour and Design You Required. Size 16"-4" Cords With Wooden Head 2.5" Tassels skrt 8". Size 16"-4" Cords With Metal Head 2" Tassels skrt 8"
*Size 14" Cords & Tassel 11". *Material - Rayon & crystal. 1)Size 16.5"-4" Cords With Metal Head 3" & Tassels skrt 9" . Size :16"-4" Cords With Metal Head 5.5" Tassels skrt 8"
*Size 14" & 4" Cords & Tassels 6"
*Size Wide 0.75", Length 14.75", Covering 1.5" & Loop 2". Size : Ribbon Dori 16"-3" With Wooden Head 1.25" Tassel 4.5"
Size 9" Tassel With 30" Spread Resin Head Dia 2.5". 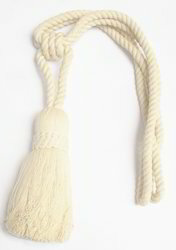 1)Size 13"- 2" Cords & Tassel 9". 1)Size 15"-2.5" Cords & Tassel 12". Size :15" Cords , Beaded Cords 3.5" & Tassel 11"
Looking for curtain tiebacks. ?